America got a first glimpse Monday of what a Republican-led effort to reverse the impact of sequestration on military readiness might look like, and there are some clear winners on the technology front. 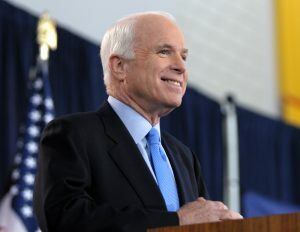 Sen. John McCain, R-Ariz., chairman of the Senate Armed Services Committee, released a 33-page white paper detailing a $430 billion increase to the defense budget over the next five years. In addition to increasing spending and boosting the overall size of the military, McCain’s strategy calls for a re-balancing of high-tech and low-tech investments. The Defense Department’s investments in cyber capabilities during the past five years has gone primarily toward building the 6,200-member Cyber Mission Force. But not enough funding has been made available to develop the tools that this force will need to deter and defeat enemies in cyberspace, according to McCain. “Just as it would be unacceptable to send a soldier into battle without a rifle, we cannot deprive our cyber forces of the basic tools they need to execute their missions. Recent budgets have omitted funding for even the most basic tools, including for cyber protection teams to assess and triage compromised networks,” McCain said. Spending on unmanned systems, particularly in the Navy and Army, could see a big boost under a Trump administration if McCain’s plan is embraced by the White House. The Navy, for example, is 34 ships short of the joint force requirement of fielding a 308-ship Navy. To make up for that shortfall while production increases, McCain calls on the Navy to focus on unmanned systems.